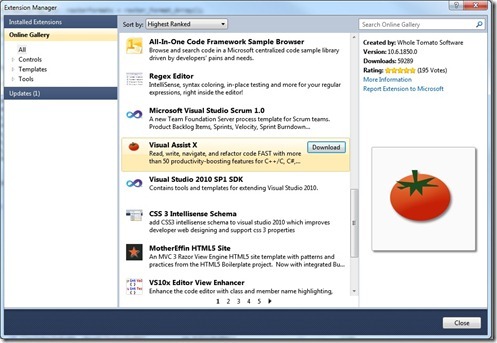 C++/CLI IntelliSense in Visual Studio vNext. Basically what they say is that there are a lot of performance, precision and other related issues so they decided to leave it out of VS2010 completely. It will not be in some future service packs or patches. As always when Microsoft failed to provide some much needed functionality third-party tools come into play. At first I personally expected this functionality to be part of ReSharper tool but sadly it’s not. Only third party tool which can provide IntelliSense at the moment of writing is tool named Visual Assist X.
or from Visual Studio Extension Manager Online Gallery. It’s a commercial product and there is no free or “light” versions so after your trial period is over you will need to pay for it. Overall it a great tool and big help particularly for C++/CLI projects but sometimes it can have problems parsing some include files so that can further lead to freezing entire visual studio. If that happens only possible solution is to kill devenv process ( Visual Studio ) and restart process all over again. Parsing include files can take some time and as every add-in it can and will slowdown your Visual Studio environment. Best way to keep things fast and smooth is to have fast PC with probably more than 4GB RAM, fast processor and off course SSD disk would bring the performance up the most. If I find something new and more useful will update this post.